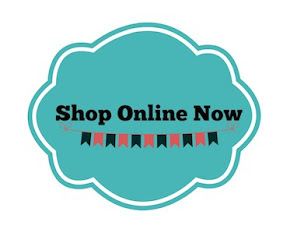 Hello & welcome to a very special CTC blog hop where all the team members CASE each other. How fun! I can't wait to see what everyone comes up with! You will have hopefully hopped here from Jess's blog where she has CASED me! Today I am CASE-ing Simone Bartrum. Simone is my Upline "grandma" so to speak, so CASEing her was a little bit daunting! I loved what Simone did with the Wonderland stamp set recently, so I decided this would be the one to CASE. To refresh your memory here are Simone's cards. 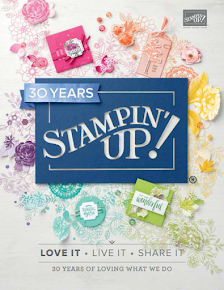 I just love this stamp set & if you follow my blog you will see I have used it lots. For this project, I wanted to try the Northern Lights technique. I have always wanted to go see the northern lights, however, I absolutely loathe the cold - so nope, I shall have to love them from afar. For my first card, I used sponges & swiped my Daffodil Delight, Tempting Turquoise & Rich Razzleberry inks over the white cardstock randomly. Then I rubbed Island Indigo ink all around to soften & blend the sky. 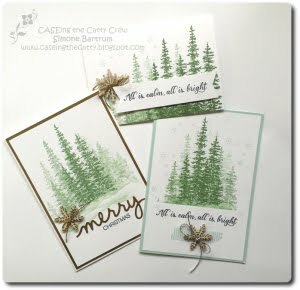 Next I stamped the trees in our Basic Black Archival Ink. This ink is seriously the best black ink I have ever used! Then I added snow with the white gel pen to give it a really wintery feel. You can see I have added a snowflake element just like Simone did too! I then decided I would like to try brayering to see if I could get a similar look. 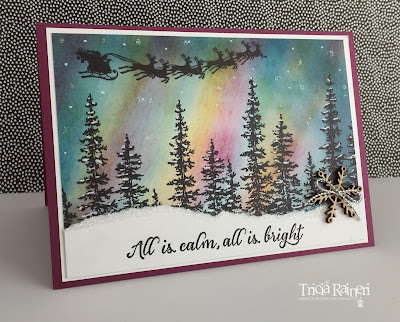 I used Island indigo, Daffodil delight & Rich Razzleberry inks to achieve the lit up night sky. Well, I was a little out of practice & had to have about 4 tries before I got it just right. Trust me my hands were rather colourful by the end of it! As you can see, I used 2 different techniques to achieve a similar effect, but I like them both. 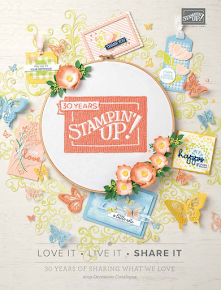 Next stop on the blog hop is Simone's blog. I hope she likes my CASE of her lovely cards. I bet she has something fun to share! If you get lost on your hop just stop in at the CTC blog to get back on track. 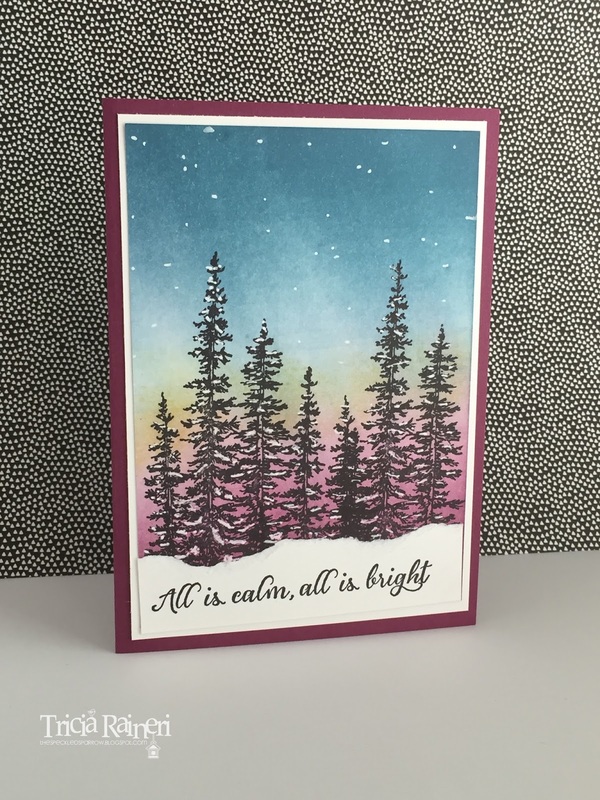 The Northern lights look spectacular in your cards, love them both. Would like to give it a go, maybe after Christmas! Wow those backgrounds are amazing!! I love what you have created. Thanks for being a part of the Crew this year. Merry Christmas, my friend! wow lots of sponging and brayering to create lovely colourful night skies, beautiful blending of colours. I have loved joining the Crew this year and are always inspired. 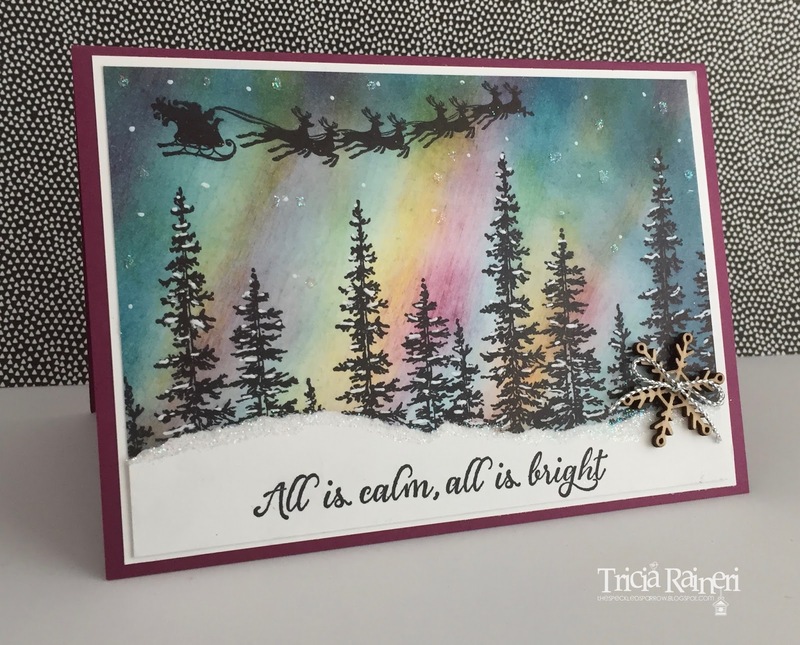 Stunning cards Tricia! A beautiful CASE that shows how a change to ink colour & background can result in a totally different outcome. Merry Christmas! A stunning CASE Tricia! Love the depth of colour in your Northern Lights - sort of translucent - prefect! Merry Christmas! 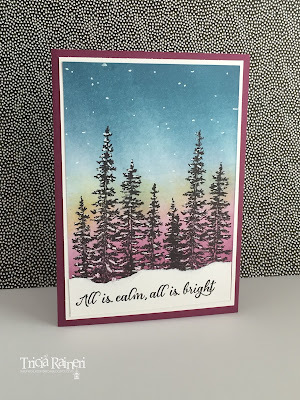 Totally gorgeous cards, and my favourite is the first rainbow card - so so beautiful!! What a wonderful CASE.